Rotheran is a Dunmer stronghold that lies on the island of Sheogorad, south of Dagon Fel. It is one of the ancient strongholds reminiscent of a brighter time for the Dunmer. 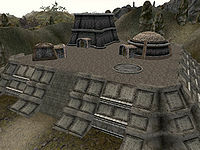 It is a relatively typical stronghold, except that it has been hollowed out to form a rough arena. The strongholds should be approached very carefully. They have largely been abandoned, but have since generally proved attractive to whatever group feels strong enough to hold them. 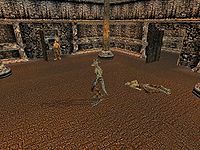 At last report, Rotheran has been taken over by a group of bandits led by the Dunmer mage Llaren Terano, who are using it to host some kind of gladiator's arena. The slave Adusamsi Assurnarairan offers medium training in Mysticism, Alteration, and Restoration until you give back her ring during the Ice Blade of the Monarch quest, at which point she disappears from the game, unable to provide further training. Rotheran has a Propylon Chamber linking to Indoranyon and Valenvaryon. The Rotheran Propylon Index can be found on Rols Ienith within Rotheran itself. It is illegal to sleep in Rotheran. This page was last modified on 19 October 2018, at 22:31.